Two students hit with a single bullet, one in serious condition and the other in critical condition. 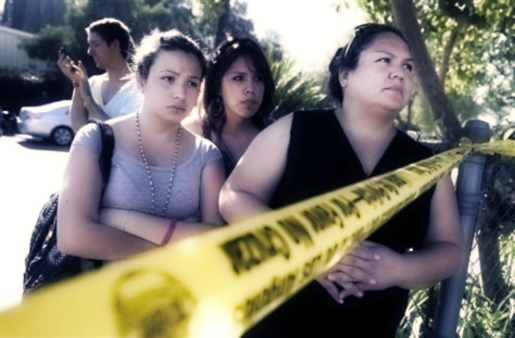 Yesterday, at Los Angeles, California’s Gardenia High School, two students were shot during a break between classes. School shootings are a tragedy, but this one is especially terrible as the deaths were completely avoidable and unintentional. The gun discharged independently of the trigger being pulled, according to witnesses. “He literally dropped his knapsack on the desk and it went off,” said John Deasy, deputy superintendent of the Los Angeles Unified School District. The student who brought the gun to school in his backpack has been arrested by the LAPD; after the shooting, the two seriously-injured students were rushed to the hospital and the school, located in LA’s Harbor Gateway neighborhood, was locked down according to standard security procedures. The reason the student brought the gun to school remains unknown. He is still being held by police and will likely be suspended from school if he gets released on bail.